Do you identify as a predator? I was at a horse show a few years back, helping a client. It was a warm day at an outdoor venue. Participants were all grooming by their trailers, parked parallel to each other in long rows. It was a camp atmosphere; friends greeted each other and shared snacks, while horses were being braided and hand-grazed. Riders left with “Good luck” in their ears and returned to calls of “How’d it go?” There’s a camaraderie at horse shows that’s hard to beat. The trailer next to ours was different. The rider was a woman; there was also an older woman and a man—he may have been one of those elusive horse husbands. They were all on the far side of the trailer, but the horse sounded especially nervous while tied and the rider spent lots of energy yelling corrections. It was a bit like having a war movie on in the next room. Everyone was aware of this rider but trying to focus on their own horses. It isn’t illegal to have a bad attitude. When it was time to ride, they moved out to the open area between rows of trailers. The man held the horse’s head tightly and the woman launched herself toward the saddle as the horse jumped around erratically. You couldn’t look away; she landed half-way on the saddle as the horse broke loose from the man, and down the lane they went, buck-prancing as the rider worked at getting her stirrups. A couple of pedestrians darted out of their way. She returned a few minutes later, unhappy with how the ride went. Imagine. The rider mounted twice more that day, each worse than the one before. The last time, the horse was running backward, rearing and spinning, as the rider yelled and kicked. I scurried to move our mounting block as the horse blindly thrashed backward, toward our trailer. The rider probably qualified as a danger to others by then, but I couldn’t take my eyes off the horse. The mare had wild fear, with whites showing around her eyes and pinned ears, in a full-body anxiety sweat. She reminded me of that classic painting of a lion attacking a horse. This mare had that same life-or-death look, as if a mountain lion was on her back, claws dug deep into her muscles and huge teeth ready to rip her open. Abject terror. This is where most of us women shake our heads and frown; so cruel and not good horsemanship. We feel sympathy for the horse and distance ourselves from the woman. I’m going to make a rude and horrible generalization: usually when we see riders like that, they’re men. We take some twisted comfort from that. And maybe we shouldn’t. For all of our study of horse behavior, we might want to take a look at ourselves, as well. Most of us think we’re kind and compassionate riders; the polar opposite of the rider I described. We work on soft hands and relaxed forward. We train with positive reinforcement. We value the partnership gained by slow and steady work. That’s the ideal. Reality Check: Even a ninety-pound, blonde, giggling vegan is a predator. We’re born that way; we just aren’t honest about it. The other word for that is passive-aggressive. And it doesn’t have a thing to do with competition. A passive-aggressive rider keeps all the fighting inside. It starts reasonably with the fear of the things a rider should fear. And there’s no shortage of true danger to consider. Then anxiety creeps in; we think about everything that might happen on the horse but also worry about how we will be judged, especially in our own minds. Then most of us like a little more control than we can have on a horse. But that’s wrong, so we stifle our fear and anxiety. We pretend we aren’t frustrated and that we don’t get angry. We say we have no ego, but instead we have an unsteady center of worry, anxiety, and regret. With a dollop of compulsive apology on top, and the cherry of self-loathing that we all learned as teenagers. These fears and anxieties soak into every cell of our bodies, just like anger and rage do. They’re just a bit quieter and more insidious. Our muscles are tense and our legs brace tight. Sit-bones rest in the saddle with the suppleness of a cinder block. Our shoulders muffle our ears and breathing is shallow. We try to calm our of need to control the universe by…tight hands pulling on the bit. It’s instinct that almost passes as normal. Aren’t all of these feelings and behaviors extreme sides of the same coin? But you love your horse, right? It isn’t about him; it’s your problem. Maybe you can make that separation in your mind, but your horse doesn’t. He just senses your feelings and he doesn’t hear the pronouns. If you feel you can do nothing right, that’s what he feels. Is this any less predatory for a horse? Any less of a lion on its back? And it’s the farthest thing from your intention to frighten your horse. Forgiveness might be a good start. Perhaps the true thing for us is that over the course of our lives, we experience all parts of this continuum of predator riding to some degree, while trying to balance the middle peace. We look to define leadership in a way that there are no losers, while hoping to travel from our ego and self-talk, to a place of true compassion for ourselves and our horses. Boss Mare, in the saddle and in our hearts. Breathe. It’s going to be okay; even better than okay. Women have a special super-power. Women are in a uniquely interesting place with horses. We are undeniably predators, born and bred. At the same time, most of us have felt like prey–at the work place, in parking lots or dark stairwells–and we’ve experienced both sides of the prey/predator world first hand. We’ve responded both as victims and defiant survivors. It’s our job to weave all of our experiences into the best version of ourselves, in the saddle and out. 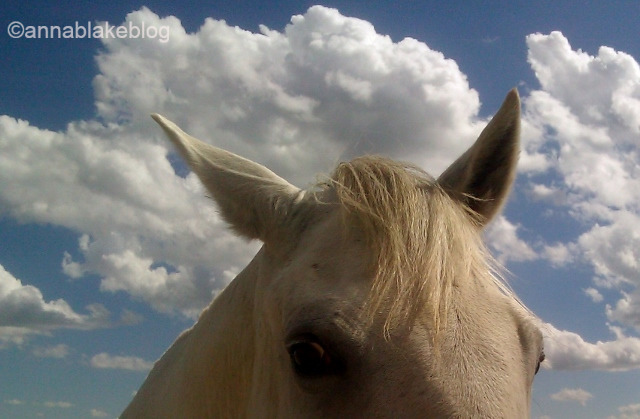 It’s how horses help us get better at being people. Oh, Anna. Just beautiful. You place your finger squarely on what it means to be human. Love. (I do suffer the affliction myself.) Thanks, deb. I SO agree with the above. You said what very few of us recognize in ourselves, Anna. It IS what it means to be human. Where’d that nail go? Oh, Anna just hit it square on the head. Thanks, Anna! Love this…thank you for putting in writing something that is so difficult to understand, even scary to think about, and harder to accept. Much like we ask the horse to push aside the fact that we are predators the horse must be asking us not to treat them as prey. Instincts. Hard to overcome. It is scary to think about, honesty is hard with horses. They read us better than we know ourselves… Thanks, Robyn. From: “AnnaBlakeBlog: Relaxed & Forward” Reply-To: “AnnaBlakeBlog: Relaxed & Forward” Date: Friday, June 3, 2016 at 9:17 AM To: Janet Kalin Subject: [New post] Women as Predators. Very intuitive sharing, thank you. At the core we cannot change what we are. We will never be prey animals even if we can identify with them. Isn’t that just the best quote ever? Forgive and go on. Thanks for sharing this comment. Something we should remember, being predators, both with horses and elsewhere. I was fortunate, I can’t recall ever feeling like prey, but I was taught to defend myself, be very aware of my surroundings and move silently. I have seen several riders of the sort you describe, both male and female, both were horrid and one the horse did buck off. Unfortunately the idiot missed the lesson and was cursing a blue streak. You’re right, it’s something we should all keep in mind. The horse is always aware of something on its back, it’s instinctive, it’s survival. In a way it’s amazing that anyone can get a horse to trust or tolerate us sufficiently to allow us to ride. Sometimes I almost think it’s a weakness in horses that they let us get away with what we do… then I think they are more patient in their process of domesticating us than we realize. Being on their back is a sacred place, no doubt about that. Thanks for commenting. I have been enjoying your blog for a few weeks now. I appreciate your wisdom and beauty of writing. Thank you for this one. Very insightful and true. Thank you, Jeannetta, I appreciate your time reading. Really good quote! Being humane seems to get lost in all the rhetoric these days! I remember seeing far too much of the predator types (!) years ago – altho nowadays, they post their “activities” online!!! Sometimes turns out better for the animals sakes – sometimes not. Yes, and being humane is not strictly relegated to being human… Love the quote! Thanks. Ghandi isn’t quoted enough in the horse world. Thank you. Reading this, I feel like I’m in church, in the very best possible way. I haven’t known how to handle myself when I’m engaged with a horse and either a) beating myself up, or b) not truly present and worrying about other things. Luckily I’m in the “know better” category around how my feelings affect horses. I’d be very interested to hear what everyone does when they get in that place. The only thing I’ve come up with is kinda dumb, but seems to have some effect. Not sure if effect is on me or them: I talk. Out loud. Tell them what I’m worried about (it’s never them, great boys!) and promise to work on it and ask for their patience. They have NO idea what I’m saying. But somehow the equation shifts a little….? Lol, I make sure no one else can hear me telling my horse why I’m currently not present enough! What does everyone DO when you realize you’re the issue, and you aren’t immediately or completely fixable? I laugh outloud, my horses like that. And I’m big on apologies, that part is for me. When I’m wrong in a lesson, I point it out to my client, so nobody gets too precious about anything. Great comment Jane. Laughing. Great one! Also happy to hear I’m not completely nuts feeling if I tell horses the truth, it shifts something. Thank you for a wonderful post and great commenting community! Brought me to tears! It is so true. I know both sides of the coin, predator and prey. it certainly brings an empathetic perspective. The back of a horse is sacred ground, no doubt about that! Putting our sacral chakra next to their powerful solar plexus chakra – what could happen? 🙂 MAGIC!!! The body position can’t be over stated! Thanks, Debbi. Oh!! There’s a perspective I had not considered before. Thank you for the morning eye opener, Debbi! Stunning post, Anna! Thank you for the work you do to bring the horse’s perspective to the forefront, but also for every insecure, misunderstood rider. I admire your ability to put into words the complexity of our relationship with our horses. I grew up riding in a very predatory model, and have spent the last couple of decades trying to unlearn most of it. As much as it makes me cringe, I do appreciate having seen how much horses do for us, in spite of us, as it just solidifies that they are the kindest, most generous teachers we could ever wish for, and just how lucky we are to have the opportunity to learn from them how to be better people. Littlepiecesofme1, thank you for the Maya Angelou quote – it’s so important to take what we learn and move forward with it. And Jane, I’ve found that speaking what I’m feeling out loud really helps me and the horses, too, as silly as it may seem to those humans in my proximity! I have to think most of us started with the predatory model, I certainly did. But yes, the Angelou quote… Thanks, Lisa. Thanks for commenting. Oh Anna, just when I wondered how this mirror of hard truth could shatter…how to dig myself out of my predator box was revealed…forgiveness. First awareness, and then forgiveness. The perfectly honed alchemy for transformation. Going after our predator instincts in a predatory way fuels them. Witnessing them and embracing them…well…we shall see, but it feels quite hopeful. thank you to the community here- what exquisite truthseekers! It isn’t wrong to be a predator; it’s an accident of birth. After that, we have to decide how to express it. AND I love this community as well. Thank you Sabina, and everyone who comments. I had never had this insight but it describes me perfectly. Thank you for this powerful insight. You’re welcome, Debra… and you know, we’re born this way. No fault. To add to the commentary, I had an aha moment sometime back when I realized one day that I would stare at my horse’s injury (whatever it was) with predator eyes which was not helping him to heal. Now I try not to do that but it’s hard. I have an idea what ‘predator eyes’ means to me… interesting thought. thanks.